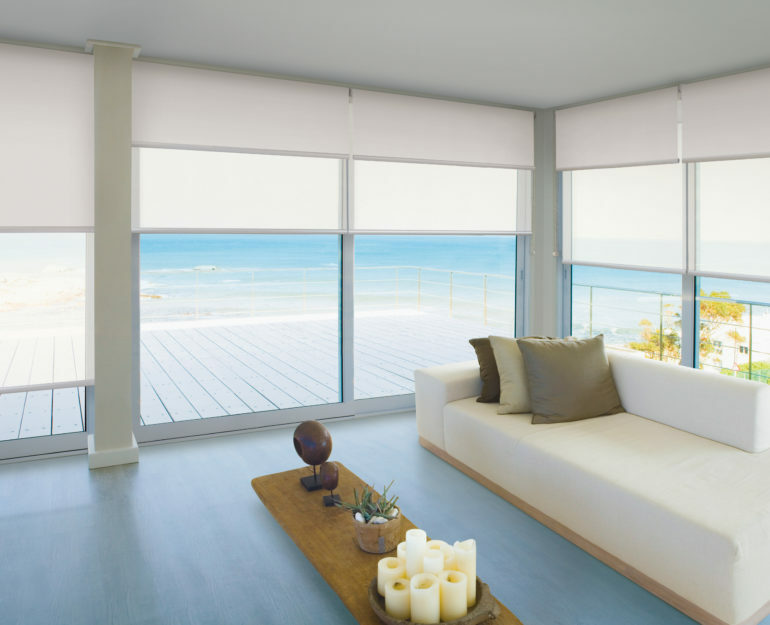 If you’re searching for roller blinds in Coffs Harbour, look no further! We manufacture superb quality LUXAFLEX® Roller Blinds in Coffs Harbour, right here in our purpose built factory. LUXAFLEX® Roller Blinds by Coffs Harbour Blinds and Awnings are adaptable and versatile, as well as being innovative and stylish. Roller Blinds combine sophisticated technology with a variety of durable fabrics, from room darkening to light filtering, to create a simple yet stylish ambiance within your home. The beauty of LUXAFLEX® Roller Blinds lies in their simple application and the ability to make them virtually disappear when the occasion calls for an uninterrupted view from your window. LUXAFLEX® Roller Blinds by Coffs Harbour Blinds and Awnings have recently introduced patented EDGE (Ergonomically Designed for Greater Efficiency) technology. It has been developed by an international design team specifically for Australian conditions. Featuring a sleek architectural design with smooth operation and unrivalled inner strength, EDGE Technology allows you to span even the largest windows beautifully. Smooth and light operation: The durable chain drive is available in two ratio mechanisms (1:1 and 1:1.75), meaning that even heavier blinds can be lifted with ease, without the need for a spring booster. Spring loaded idle end:The universal spring loaded idle end also allows for smooth and easy installation, and also makes taking your blinds down to clean an easy process. Outer beauty: hardware components are available in a range of modern colour choices to ensure LUXAFLEX® Roller Blinds by Coffs Harbour Blinds and Awnings suit your decor. Universal brackets: which means the operating side can be changed simply on-site if required. Aluminium bottom rail: All LUXAFLEX® Roller Blinds by Coffs Harbour Blinds and Awnings are available with the Ellipse Balance Rail which features a sound proofing bumper, to ensure minimal banging noise on windy days. Sanitized® fabric: Many LUXAFLEX® fabrics are treated with Sanitized® hygiene function which works to keep odours away, stop mildew and fungi growing on your blinds, protects against the development of bacteria, and is free of harmful substances and is recommended by institutions for allergy sufferers! 5 Year warranty: provides peace of mind with your purchase. Dual Brackets or Duo Blinds: this option allows you to combine the functionality of two different fabrics in the one roller blind system offering flexibility to adjust both light levels and night time privacy in the one application. Linked Blinds: Link your blinds together for ease of operation, either independently or simultaneously. Head-box: A sleek (84mm projection) and contemporary head box and fascia system can be installed in both reveal and face fit positions and have a snap lock cover and plastic outlets for easy installation and quiet operation. You also have the option of side channels for a complete block-out option. Motorisation: motorised Holland blinds combine the flexibility and convenience of automation for enhanced internal comfort and control. Don’t forget to check out Luxaflex’s groundbreaking Qmotion Technology! Covered by a 5 Year Guarantee, LUXAFLEX® Roller Blinds by Coffs Harbour Blinds and Awnings are sure to suit your every need. Call us today on 66915100 for your obligation-free in-home consultation!